Tuesday 10am Bacali drives me to meet Bernard and his colleague Walter. Thankfully today we only have to drive for about 40 minutes, not 90. That, and a night of rest, had me feeling excited and groovy in anticipation of today’s Peace Pals workshop. When we arrived at the school, we walked to meet the Head Teacher and as we got close to the building, there was a single whistle. Students all over the yard stopped and kneeled down. It was instantaneous and absolute. Every student in the yard, about 4 or 500 stopped in their tracks and kneeled down. I stopped in awe and watched. There was total respect and poised control by each student waiting for the next signal. And then, after about 3 seconds, two quick sounds of the whistle, and everyone went running for class. I was filled with a joyful amazement. From a quiet and calmed stillness to a chaotic frenzy in split seconds…. I knew this was going to be a fun day. The Head Teacher greeted us with open arms, asked us how many students we wanted to work with and quickly directed us to the tree at the corner of the building to set up. We had initially discussed working with 100 students, and then found out that there we going to be more like 120. I smiled and agreed such a number would be fine. Once we had gathered and began, it felt to me like there was a lot more than 120 students sitting before me. We did a nice long meditation while seated and talked at length about what it means to create peace in our lives. And then I asked the group to stand and create a large circle. It became even clearer when we stood up to form a circle, having made circles with 80 – 100 several times, that there were more, but would have to wait until we were finished to get an accurate count. This circle was one of the most powerful experiences of all the Peace Pals workshops I have led. The group was large and the energy was high. The students were warm and playful, fun and engaged. 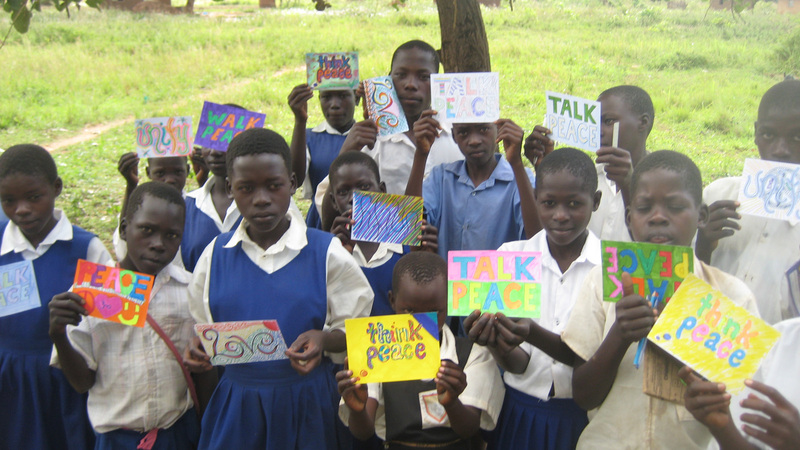 As I showed them postcards from the U.S. students I asked them to consider the different slogans: “Walk Peace” “Talk Peace” “Think Peace” and “unity”. There were a couple of things that happened during this workshop that stood out. The first was something I had experienced before, but hadn’t put my finger so precisely on, was the fact that these students very rarely make eye contact with an elder. There is a submissive, subordinate behavior that represents their way of showing respect. As we talked, one student spoke of “greeting another” as a way of showing peace. And so naturally, I stuck out my hand for a shake. He responded and we held a grip for a moment. I was waiting for him to look me in the eyes and he wouldn’t. So, like many Ugandans do, I continued to hold the shake. He tried to pull away, and I held lightly, until finally, his discomfort was clear and I let go. But what I felt and what I found was my ticket into talking about the power of eye contact and what it really means to “see” another person. By looking someone in the eye, you acknowledge them. You see them. You share that moment of soul connection. Hearts open with eyes exposing the vulnerability of that deep inner you. You allow someone to see “in” and in doing so, show them that you too are a human being, full of love. This is a powerful practice and it proceeded to walk around the circle making eye contact with as many of the students as I could. I expanded on the topic by sharing these thoughts: In war and in violence, there is only blindness. There is no sight. There is no love. There is a visionlessness of destruction and despair where fear blocks sight and anger enables one to act in an in-humane way. So the only way, is to SEE each other and acknowledge that ability to open our eyes to look and be, simply be with and therefore accept each other for exactly who we are, as we see another before our eyes, without story, judgment, or evaluation. This is a powerful act of peace. We woke at 6am for a 7am pick-up in preparation for a long drive north to Lira, 5 hrs north of Kampala. Along the way we picked up Lynn’s colleague Penelope and her 8 yr young son, Sam. I think we made good time along the way and arrived in Loro, about 30 minutes outside Lira to drop the two Hewlett Foundation Employees at the Teachers College there. Sam and I continued to Lira with Bacali, our driver, another 30 mintues up the road to meet Bernard and Tony of Art for Children – Uganda, the NGO I was going to be partnering with this week. 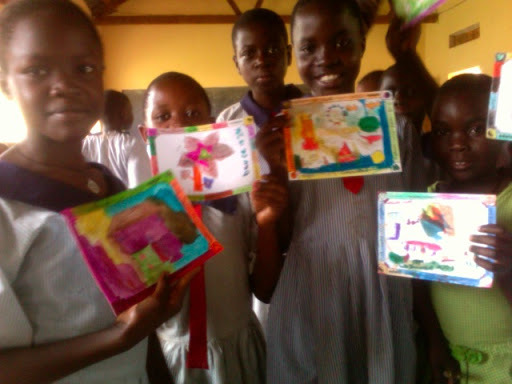 Art for Children – Uganda is under the umbrella of War Child Holland, and uses art and creativity to support the healing and education of young people in this war torn Northern region of this country. After picking these two men up, we drove for another difficult 90 minutes further North into the bush on rough dirt roads. Being tired, hungry and uncomfortable made it a challenge for me to maintain my composure and not get upset, considering the further we went, the further Bacali was going to have to drive back to pick up Lynn and Penelope, who were equally exhausted and expecting their driver to be there when they finished. Needless to say, I had to surrender to the road and the journey we were on to Ogeno Primary School. This morning I woke up nervous. My heart was beating fast and I felt a little shaky; uneasy in anticipation of my upcoming workshops. Perhaps it was because I had hired my friend AK to come a film the experience. Perhaps because I was scheduled to do two workshops in one day with 100 students per session. Perhaps I was just feeling shy, unprepared, and empty bellied hungry. It was not a foreign feeling. Definitely a place of familiarity, not necessarily of comfort, but more of a feeling of nervous excitement and my mode of doing double-check mental preparations being expressed in the body as a hollow, scared emptiness. Perhaps I will always experience this feeling, on some level, whenever I am preparing to step into the unknown, open my heart and share myself and this Peace Pals, or any project I started, for that matter, with a new group of participants. We arrived at the school, met the Head Master, a nice man named Peter Okoth, who graciously received us and showed us around. We settled into a room in a building under construction at the top of their property to set up for doing workshops with the P4, P5, P6 and P7 classes. These students were brilliant. Our plans to have two groups of 100 (P4 & P5’s and P6 &P7’s) was a bit ambitious given the size of the room, so we opted to work with one class at about 50 per session. Here are some of their replies. I was already moved and we hadn’t yet begun to make art. When I showed the group the postcards from the students in the U.S. I talked with them about the various slogans: think peace, walk peace, and talk peace. At one point I asked the group, what does it mean to walk peace? One boy raised his hand and said, “to walk with love in your heart.” I was “wow’d” I asked him if he would demonstrate that. He agreed. I smiled. Shuffling from his bench, he began to walk down the center of the room, head held high, moving slowly, deliberately down the middle space in the room. Some of the others began to laugh and I quickly asked them to be quite and observe. I asked the young boy, perhaps 12 years old, to close his eyes and really demonstrate what i meant to “walk with love in his heart” and he did. This boy was amazing. He closed his eyes and with a slight smile, walked slowly down the center of the room. I was moved. Chills running throughout my body. As he approached me I invited him to turn around and continue back towards his desk table. He was a remarkable example for the room and there was a quiet and calmness in everyone as they observed. Then I showed them the Om card. And I explained to them that this was the sound of peace. We practiced together. I find that when you get a room of 50 or 100 Ugandan students to Om together, it’s quite a powerful and beautiful thing. And so we did just that. I had them close their eyes again. I demonstrated the sound of Om, and then we practiced a bit of call and response, before collectively Om’ing together three times. This was super fun and they found it both amusing and enjoyable. I tell them things like this. Eyes closed. Going inside. You are safe. Everyone here is friends. There is nothing to worry about. Feel at peace. Feel your heart. (some students put their hands on their chest) Relax. Notice your breath. Breathe easy. Relax your body. Be calm. This is the practice of being peaceful. All the while chiming my Tibetan hand cymbals three times. And then we open our eyes and carry that energy into the writing and art making for peace. As I instruct them to consider what peace looks like and feels like, sharing their thoughts and feelings with that anonymous person in India a little something personal about themselves and their lives on the postcard. On Tuesday I was in a local private school here in Kampala. A short walk from In Movement in Kansanga. The school, St. Kizito, is a catholic primary school serving approximately 350 kids. The students were very well behaved, very friendly, and pleasantly communicative….something I rarely find. Often, there is a pervading shyness….and a real hesitation to talk with the strange teacher in the room…..but today was a bit different and the students were much more forward and talkative with me, which I appreciate. For a little more than 2 hrs, I facilitated a Peace Pals wrokshop with about 100 P4, P5, and P6 students in an age range of 8 – 16 year olds. The kids were great. They were attentive and eager to share, more so than I had experienced in previous schools. The hilarious part of this day was my Vado HD video camera was out of battery and my camera ran out of battery in the first half hour. So I pulled out my mac and opened photo booth and the kids got a total kick out of seeing themselves on the screen and having their photos captured right before their eyes. Wednesday March 10th. 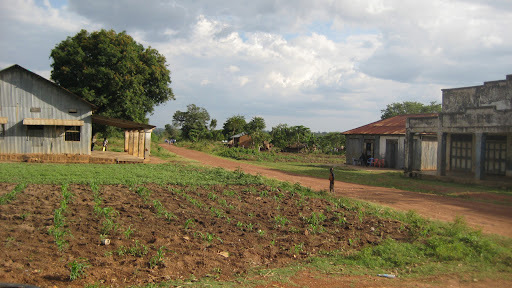 I took a 90 minute ride out of Kampala to the village. I went to a place called Kakili to visit the orphanage and primary school run by a guy named Joshua who I met on the stairs of the Imperial Royale hotel in downtown Kampala. He asked me if I was a volunteer ( a category of white person in Uganda there on service) I told him about my project and that I might be able to come. He called me a lot….a lot a lot to get me to come to his school. I had no idea where I was going, but I should have when my driver told me that he was going to charge me 80,000 schilings…..which was more than a trip to the airport. I even texted Lynn to confirm that I wasn’t getting taken. But you know what, for the 90 minute ride, his 3 hrs waiting on site, and the return trip home, $40 wasn’t too bad. Plus, it was the only way I was going to get to this village about 3 miles off the main road on a broken and crackling dirt road into the distance. This main room where three classrooms met was the only not earthen structure on site. This photo shows you two classrooms. Broken chalk boards on the ground leaning against the reed walls. No books. No nothing. Students barely had things to write with. And so I asked Joshua if we could gather in the main room. Bringing all the students, even the wee babies, learning their ABC’s off a yellow poster board in their mud room, into the main space for a little art making and peace time. It was quite a setting. Benches were situated like a classroom facing the front….and I quickly requested that we rearrange the around the outside of the room and make a giant rectangle/circle where everyone could see each other. We organized that quickly and then found that there were too many students to make one large group. So onto the floor went a tarp and the P6 and P7 students seated on the ground. And so it was time to begin. I love to put a group of 120 excited and energized Ugandan students ~ fascinated by the tall white man in the room, curious as all get out about what in the world we are doing ~ into a moment of silence….a group meditation…. contemplating peace in their heart, breathing deeply, and sitting quietly for several minutes. I find this place to be an energizing and exhilarating moment where even I struggle to close my eyes because I want to see all of them in this state of calm, breath aware, and introspective. There is so much energy swirling. So much excitement. It’s great fun to ask everyone to close their eyes and breathe peacefully, if even for only one minute. I meditate on my own before I arrive. Have you ever been swarmed by mosquitos? Or accidently hit a bee hive with the tractor? You know that feeling of being surrounded by that pure intensity and energetic force of life pulsing towards you? 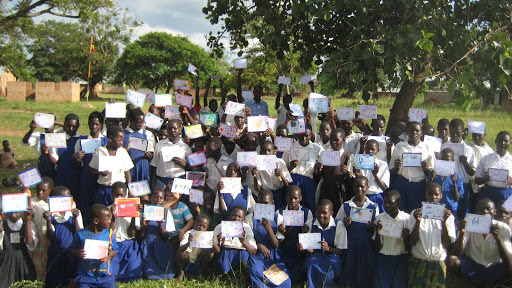 Well that’s kind of what it’s like when you pull out the art supplies in a rural (or any) school in Uganda. There are the moments when all is calm. Students are engaged and listening to the tall caucasian guest. Everything is peaceful, for it is peace we are discussing and the practice of being peaceful is what I am there engaging with them. The attentive, quite, calm, curious, shy, hesitant to speak, slow to raise ones hand, nearly fearful of speaking up in front of the class is quickly and almost instantaneously dissolved when a can of markers, or box of crayons gets opened. 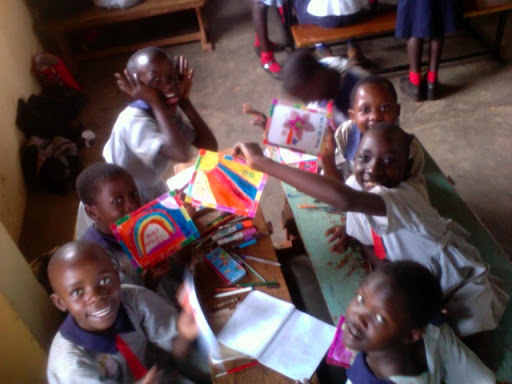 As soon as the Art supplies come out……kids swarm. Hands fly. Reaching. Grabbing. “Master! Master! Master!” I ask them to sit. I gently usher them back to their seats, so that I can pass things out neatly and carefully into the hands awaiting…..but as soon as you begin to distribute them….the hands and bodies quickly come flying at your face. I find it kind of enjoyable, exciting…..you are wanted and deeply sought after. You have something that they desperately want. Ten to fifteen pairs of hands flying in your face can be kind of overwhelming…..and somewhat fascinating…..because it is that pure excitement, a primal urge, and eagerness to get involved that has me smile back at them. This was an amazing workshop. 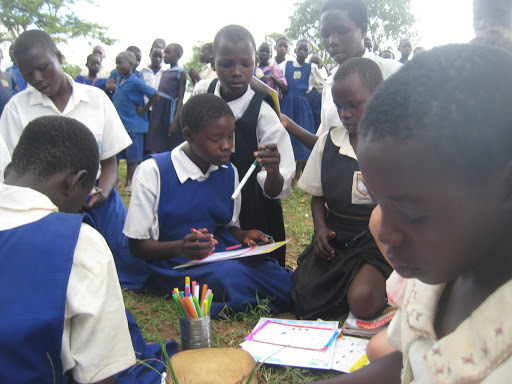 My first experience in a Ugandan School. On Friday afternoon, my friend Moses and I headed over to the Lawanda Primary School. A nice little school situated on a beautiful grassy knoll with an amazing tree in the middle of the hillside leading up to the school. I was there to work with their P7 students. 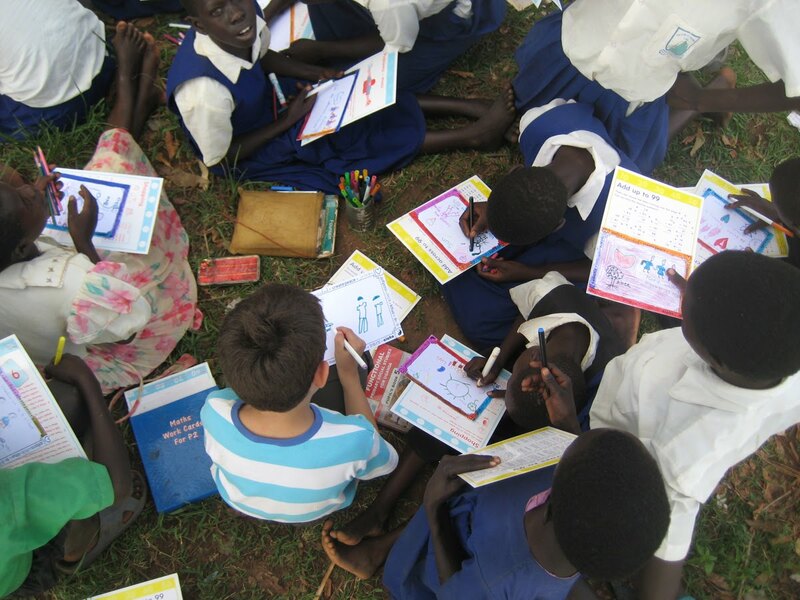 In Ugandan schools, unlike in American schools, students attend classes, not grades, labeled as P for primary, and S for secondary. There are 7 primary levels, and 4 secondary levels, plus 2 additional secondary pre-collegiate levels. There are really no parameters of age for a given class level. If you pass your year-end exam, you move on to the next class level. And if not, you stay behind. So in any given class, you could have a 5 or 6 year (or more) age range between students depending on how quickly they learn and move forward. In this P7 class there were about 120 students ranging in age and size from small little 12 year olds, to grown boys of 16. This is quite an interesting scenario, given that the younger kids are often quicker to understand what is going on and equally, if not more, capable to write and read as those 5 years older. I shared with them about the Peace Pals project. As I have done in each of the five workshops I have led. I tell them about where I come from, showing them a map of the U.S. and where in California I reside. Given that in each of the five settings I have worked there has not been a map on the walls (nor any additional educational material, for that matter) I give them time to look at the map and really see where places are. After showing the map of the U.S. I either show them a map of Africa, and/or a map of the world. I begin to explain to them how they are part of a huge project involving thousands of students and that not only are they receiving postcards from students in America, but they are going to be creating postcards, sharing their art and messages of peace, with students in India. Using the world map, and also a map of India and the sub-continent, I show the students how the project is really world wide ~ connecting the U.S. to Uganda, Africa, and onto India. Eyes wide, attentive, and eager to see the world, the map proves to be a highly effective tool to showcase the vastness of the geography of this planet, as well as the scope of this project they have randomly been selected to participate in. During this afternoon workshop, I had the idea to take this group of 120 out of the classroom and talk to them about Peace and the expression of being peaceful outdoors. Having initiated the conversation in the classroom, a few of the students sharing their thoughts on peace as “freedom” and “Friendship”, “being kind to each other” and “sharing love”, I reminded them that peace is also a state of quite, of silence, of being at ease and calm within. It was at that point that I asked them to single file their way out of the classroom, row by row, and make their way down to the magnificent tree in the yard bellow. Standing in this circle around this glorious tree, we stood together in one giant circle. I asked them to consider what we had talked about inside and to feel where that “peace” resided inside. I then led them in a single rotation around the tree. Taking three steps back to make room, we slowly walked around the tree in silence. This was a powerful moment for me, watching as this group of students certainly did something they had never done before. Some laughed, others questioned the tall white man orchestrating this silly game around their tree. But after completing the entire circle, the students arrived. They dropped in. We tightened the circle and stood in silence. I chimed my Tibetan cymbals and we took several breaths of peace together. There were tears, there were hearts opening, and there was a feeling of ease and relaxed joy on the faces of these students. Upon completion of our meditation, we returned to the classroom in that same single file, and made out way into the creative aspect of this Peace Pals workshop. It was an amazing week. Working along side my friend Maddy from Scotland, her pals Bob and Georgie from England, local artist, and director of the Community Based Organization working with these 20 plus street kids, Moses, two other Jinga-based artists Angelo and Dillah, and contributions from Lynn, our mural really came together nicely over the course of one week. We were prepared to paint most of the day, everyday, but due to the unpredictable rain, we were only able to paint for half days on Wednesday and Thursday. Wednesady morning we were out and gearing up to start when these ominous dark clouds rolled in. I tell you, the rain came down in buckets. It was like someone had flipped the switch, from a drizzle to a dump, and in a matter of minutes it was pouring. Thankfully we had made our way to cover in time. That afternoon, Maddy and I and a few of the boys were prepared to get into motion only to find the compound where we were storing the ladders locked and no one home. So…there was only one alternative….Hop the wall. So up in went, climbing the door and over the 9ft wall into the residential space of several families. I passed the ladders across the wall to Maddy and strategically beneath wires before climbing back across to the other side. 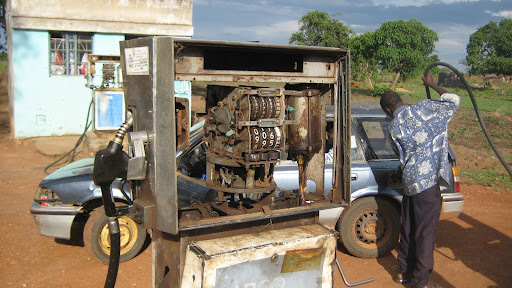 This fun predicament only occurred one other time, and by that point, we simply laughed at the reality of doing a project in Uganda and the troubles of logistics and coordination that seems to be all present wherever you may go. Our efforts we steady and consistent, working with Mother Nature to ensure we met our goal of a completed mural by weeks end. Each day was a fun and adventuresome experience working with the boys, and entertaining questions and curiosities from local passer-byers. The boys loved to paint. They were eager and excited to see us arrive each day and thrilled to watch the mural evolve. More than anything, they loved watching themselves appear on the wall. After tracing them in funky positions with chalk, we blocked out the background to highlight the negative space of their bodies. There were certain laughs in doing this as the boys and one girl had to be held up and balanced on this narrow little ledge for tracing. The final boy, the youngest and one of the most joyful, was flipped upside down for a bit of a variety. During the first flip we lost his shorts, and quickly set him down. Then tying a shirt around his waist, we hoisted him up again. This time, certain to keep his wee peeper under cover. Aside from a moment of indecent exposure and a bit of creative ingenuity The project went smoothly and with ease. Many people coming out to contribute and participate made this a fun and exciting collaborative effort. On Saturday, Lynn arrived and brought in some new paint, and with the efforts of Maddy, Bob, Lynn, Dillah, Angelo and myself, we wrapped things up on Saturday evening. Our mural is titled: Our Future Dreams : Abliloto Biafai Abiommaso and is in honor of this group of 20-odd street kids and their vision of a brighter tomorrow. Ten days ago I met Maddy, a friend of Lynn’s, who has been working and making art in Uganda and throughout East Africa for the past many years. She and I had lunch and talked for about 2hrs. 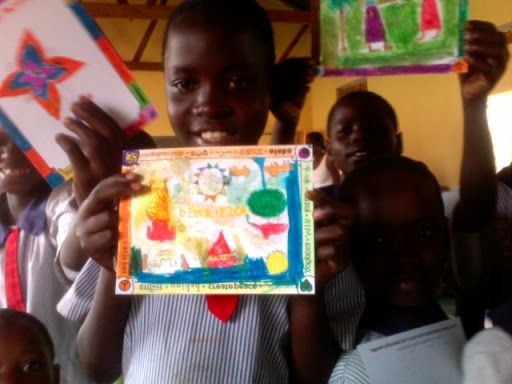 The topic of mural painting came up, as did the name of a local artist, Moses, who works to support about 20 street kids here in Jinga, Uganda. After a breif talk on Friday, we met Moses on Saturday and we were into the discussion about how to get a mural project going in the next week. I went back to Kampala and Maddy secured the wall for us to paint on. I bought paint and gathered my things and a week later took a crowded Matatu (mini-bus-taxi) ride from Kampala back to Jinga. On Monday we met with the group of 20 street kids and did a design workshop with them, including some breathing exercises, peace talk, and inspiring their involvement in the painting of this mural. Then we asked them to draw their dreams. Each child drew things like images of a home, or a farm, or community living space. Some drew their desired profession and future career. Maddy and Moses and I met that evening to combine their ideas into a cohesive vision for this mural. The next morning we rounded up some equipment being loaned to us, a couple 50 gallon drums, some wood planks to stand on, the two ladders ( including the one we had built for about $4) and our supplies to get painting. Glen Park Elementary Spring Mural ~ COMPLETE! Create Peace Project is going to Sarajevo! Join Us!